Now, before you think we’ve completely gone off the deep end (after all, what does groovy Grüner Veltliner have to do with old-vine vineyards of California or Rhône varieties), please let me explain. I’m a huge Grüner fan. It’s one of the great white grapes of Austria and when farmed meticulously at a great site, like the stony terraces above the Danube in the Wachau, the variety can produce some of the most thrilling white wines in the world. Hence, when asked by Steiner’s vineyard manager if I would like some Grüner Veltliner planted on the old, hand-built rock terraces above a small lake on the property, I immediately said yes. The owner was skeptical (he had never had a Grüner before) but after sharing with him a bottle of 2002 F.X. Pichler Dürnsteiner Kellerberg, he was hooked. 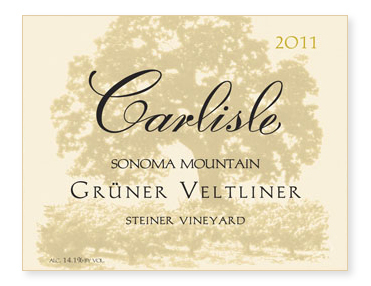 Two-thirds of an acre was planted in 2007, and now, just over five years later, we are thrilled to offer the first Grüner Veltliner produced from Sonoma County grapes. Not only has this wine exceeded all expectations, we believe we may have discovered a bright new future for Sonoma wine!